This section is dedicated to the weaponry employed by the French infantry in the Great War, 1914-1918. Please note that the majority of the images and content in this section are from http://armesfrancaises.free.fr, an excellently detailed site on French firearms. From top to bottom: Lebel m. 1886/93; Berthier m. 1907/15; Berthier m. 1907/15 M. 16; R.S.C. model 1917. Note: In 1914, there were a number of models of the Gras rifle still in use. These include the models 1866 M. 74, 1866/74 M. 80, 1874, 1874 M. 80, 1884 and 1885. The primary model though was the 1874 M. 80. The models 1866 M. 74 and 1866/74 M. 80 were simply refitted Chassepot model 1866 rifles, while the models 1884 and 1885 were similar to the model 1874 with minor refittings. Length with bayonet: 72.2 in. Length of barrel: 31.3 in. Weight loaded, with bayonet: 10.4 lbs. Average rate of fire: 9 shots per min. *Most of the 820,000 Gras rifles available in 1914 went to the territorials and road-guards, and these were maintained until the end of the war. Additionally, 26,630 model 1884 and 1885 rifles were distributed to train squadrons, medical assistants, customs officers, forest rangers, and to some older reservists upon their arrival at barracks; 3,500 model 1878 rifles went to the Paris fire-fighters and to the Republican Guard; 13,000 additional Gras rifles went to the garrison at Madagascar. 146,000 model 1874 M. 80 rifles will be transformed into 8 mm rifles by replacing the original barrel with one similar to that of the Lebel. These are referred to as the model 1874/80 M. 14. This transformation program will take place from November 1914 to October 1915, when it is abruptly called off. As early as January 1915, 39,000 model 1874/80 M. 14 rifles had been sent up to the zone of the armies. In 1915, 450,000 were sent to Tsarist Russia. The remaining stocks of Gras rifles (all models) were either transformed into flare-launching guns or sold off to foreign private firms. 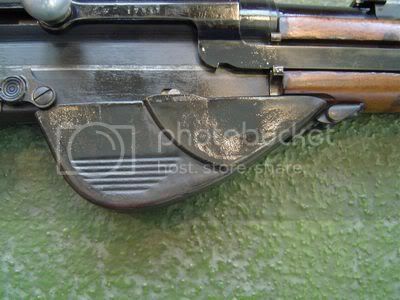 Detail of Gras rifle with the bolt open. The underside of the Gras rifle showing the cleaning rod lodging. Length with bayonet: 71.9 in. Length of barrel: 31.5 in. Weight loaded, with bayonet: 10.8 lbs. Average rate of fire: 8-10 shots per min. 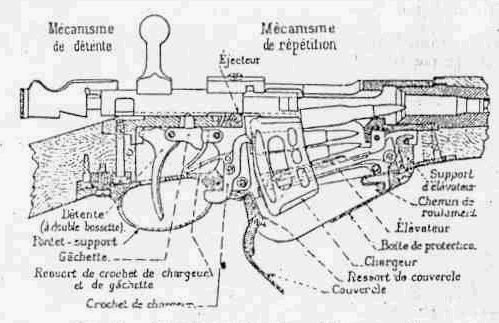 Diagram of the feeding mechanism for the Lebel, showing a round in the chamber, the transporter (empty) and 2 rounds in the magazine. Length of barrel: 31.6 in. Weight loaded, with bayonet: 9.6 lbs. Note: There were two variants of the Berthier model 1907/15: a 1st type with an "elbowed" bolt set at a right-angle to the stock and a 2nd type with a straight bolt. It was this 2nd type that saw distribution in the Great War. Average rate of fire: 15-20 shots per min. Private manufacturers: Delaunay Belleville, Remington (9,400 examples), Contin-Souza (bolt-boxes), Avis in New York (barrels), Zavaterro (stocks), and others. 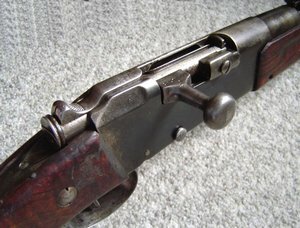 Detail showing the ejection window for empty stripper clips. 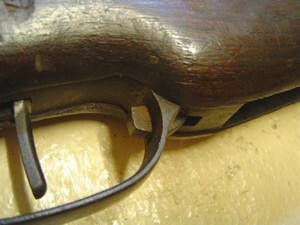 Detail showing the stripper clip stop in the trigger guard. Note: The distinction between the model 1916 and the model 1917 is that the former consisted of converted model 1907 M. 15 (3-shot) rifles and the latter were those newly made with the 5-shot magazine. *Both 3-shot and 5-shot stripper clips were accepted. Diagram of the feeding mechanism for the Berthier, showing a round being introduced into the chamber. Detail showing the protection box with the cover open (the empty stripper clip drops through). 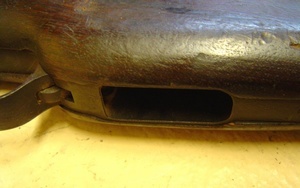 Detail showing the hand-guard (put in place to protect the hand from the heat of the barrel). Length with bayonet: 72.8 in. Weight loaded, with bayonet: 12.5 lbs. Note: There were three variants of the RSC (Ribeyrolle, Sutter, Chauchat) model 1917, or F.A. 17 (Fusil Automatique 17) as it was also known. 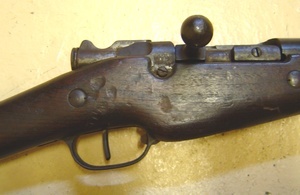 The 1st type that did not have a hand-guard on the top of the barrel (see image at top of page) to protect the hand against the heat of the barrel; a 2nd type and 3rd type incorporated minor modifications to help simply production and functioning of the rifle, in particular on the bolt stop device. The rifle pictured above is the 2nd type. Average rate of fire: 35 shots per min. Diagram of the feeding mechanism for the R.S.C. model 1917. Detail of the bolt-box in closed position. Detail of the bolt-box in open position, bolt set to the rear. Detail of the stripper clip housing. 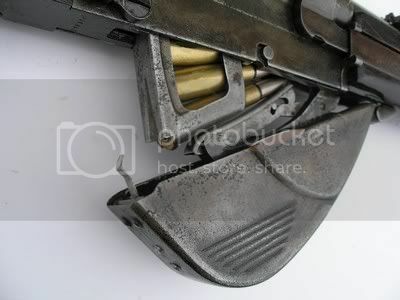 Detail of the stripper clip housing open with full clip fitted inside. A number of other rifles were used from 1914-1918 by the French army. Some were pre-war productions while others were manufactured during the war. Below are some examples of these. The Gras model 1902 rifle was distributed mainly to Indochinese tirailleurs before the war. Length with bayonet: 64.8 in. Length of barrel: 25 in. *Note: The Gras model 1902 was first set up to fire the 'M bullet' but was later modified to fire the model 'D bullet'. Total examples produced: 32,800 (22,800 to Indochinese tirailleurs and 10,000 to Persian tirailleurs. Period of use: 1902 to 1918? The model 1907 rifle was distributed to Senegalese tirailleurs before the war, and is also referred to as either the 'Senegalese tirailleur rifle or the 'Colonial rifle'. Its design was based off the Lebel model 1886 but was constructed with the Mannlicher-Berthier firing mechanism. *Note: The model 1907 was first set up to fire the 'M bullet' but was later modified to fire to model 'D bullet'. Period of use: 1907 to 1918? The Meunier A-6 model 1916 was an experimental semi-automatic rifle that first began development in 1905. The Meunier gained official approval in 1913 but was only put into production on a small scale as an 8 mm semi-automatic rifle was preferred. Length with bayonet: 66.5 in. Length of barrel: 28.2 in. Weight loaded, with bayonet: 9.8 lbs. The Remington Rolling-Block model 1915 was specially made upon the request of the French army by the American firm Remington. The rifle, which was set up to fire the 8 mm round, constituted the largest single order placed by the French army during the war of a foreign-made rifle. It was distributed to rear-echelon troops, primarily the drivers, conductors, the supply train and the heavy artillery. Length with bayonet: 57.4 in. ; or 61.1 in. Period of use: 1915 to 1918? The firearms listed above are distributed to rear-echelon troops, primarily drivers, conductors, the supply train and the heavy artillery.